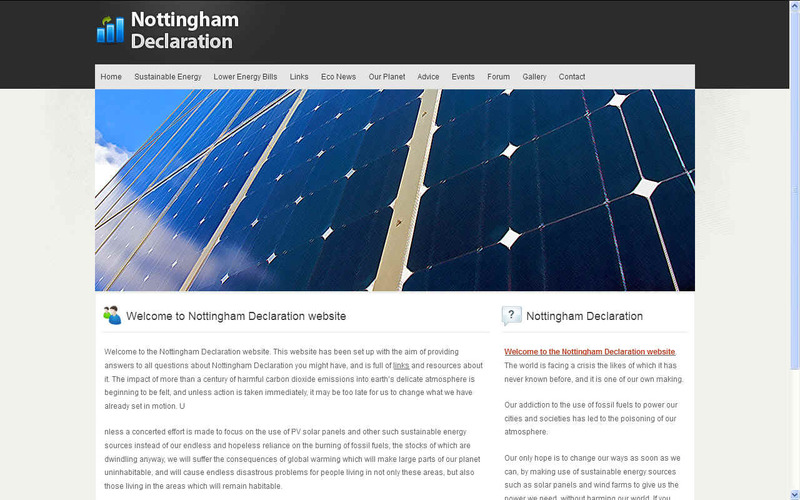 NOTTINGHAM DECLARATION - According to their website: "Unless a concerted effort is made to focus on the use of PV solar panels and other such sustainable energy sources instead of our endless and hopeless reliance on the burning of fossil fuels, the stocks of which are dwindling anyway, we will suffer the consequences of global warming which will make large parts of our planet uninhabitable, and will cause endless disastrous problems for people living in not only these areas, but also those living in the areas which will remain habitable. Our future survival lies in the harnessing of green technologies such as photovoltaic solar panel technology which can allow us to power our homes and cities without poisoning our atmosphere with dangerous chemicals. Cities of the future need to see a new style of planning and design, with solar panel arrays covering every spare centimetre in order to provide the extensive amount of energy we would require to carry on living as we are currently doing." 1.1 This MOU has been created in acknowledgement of the pivotal role councils have in tackling climate change: by reducing carbon emissions from their own estate and operations and enabling their residents. 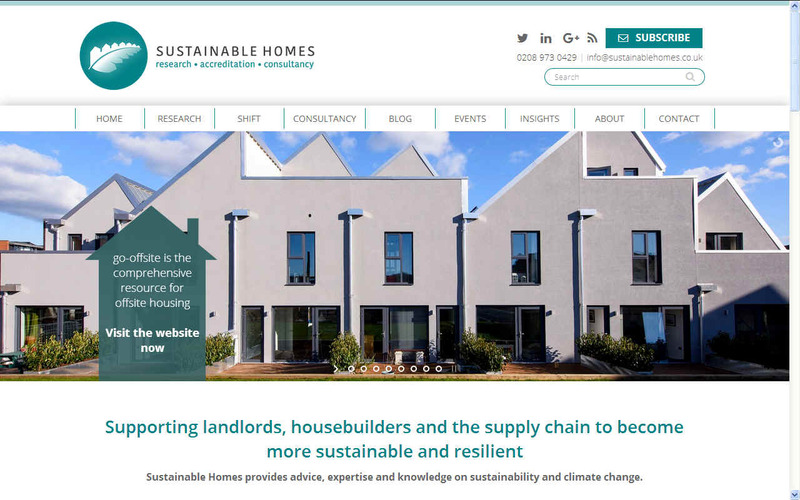 businesses and visitors to reduce their carbon emissions; and by achieving national priorities such as the Green Deal and renewable energy deployment in a locally appropriate way. 1.2 This MOU recognises how councils, through local governance, can ensure climate change policies and programmes protect and help the most vulnerable, particularly the fuel poor. 1.3 This MOU recognises that policies set at a national level affect the ability of councils to act at a local level, and that local action effects the ability of national government to meets its targets. 2.1 To set out the partnership arrangements between the Department of Energy and Climate Change (DECC) and the Local Government Group (LG Group), including scope, governance, accountability and roles and responsibilities. 2.2 To set out the DECC and the LG Group will progress the LG Offer on Climate Change starting with the milestones at Annex A. 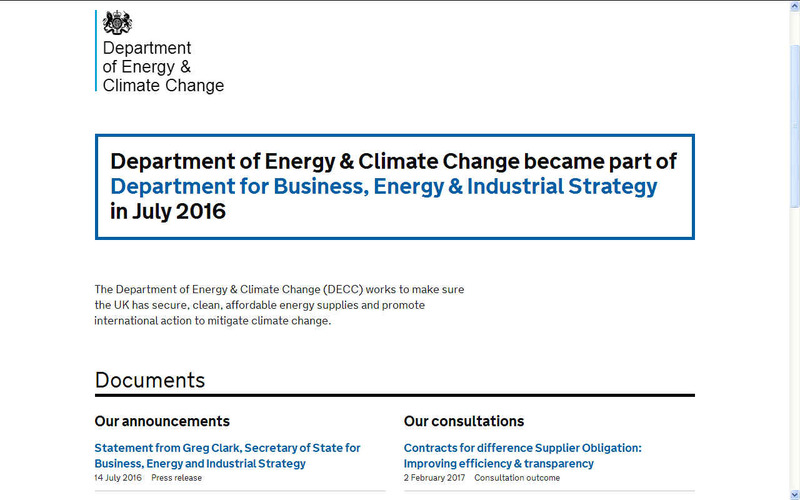 3.1 The subject matter of the MOU is the energy and climate change policies within the DECC's remit. 3.2 The MOU is signed by the LG Group as the representative body for council in England. In meeting the objectives of the MOU (as outlined in paragraphs 3.4 and 3.5 below), the LG Group will continue to reflect the insights and ambitions on their member councils. 3.3 The lG Group will work to build the individual commitment of councils to a high level of ambition on carbon reduction. 3.4.1 The 80% greenhouse gas emission reduction target in the Climate Change Act 2008 by 2050 against a 1990 baseline. 3.4.2 The fuel poverty targets arising from the Warm Homes and Energy Conservation Act 2000. 3.4.3 The target to supply 15% of the UK's energy consumption from renewable energy by 2020 as set out in the 2009 Renewable Energy Directive. 3.5.3 Participate in national carbon reduction initiatives at the local level, particularly the roll out of the Green Deal, smart metering and renewable energy deployment. 3.6 The MOU will be reviewed annually and a report will be produced jointly by DECC and the LG Group by the end of May of each year. The report will set out the achievements of DECC, the LG Group and councils with progress against the milestones set out in Annex A, as well as areas of concern, and any proposals to amend or update the MOU. As set out in 4.2 this will be reviewed and agreed by DECC and the LG Group and published. 3.7 In addition, the MOU will be reviewed at the end of each national five-year carbon budget period - starting in 2013 (for 2008-12). This review will evaluate the success of the MOU in making progress in meeting climate change mitigation and related objectives (in particular in helping to reduce emission accordance with the Climate Change Act 2008 and any other relevant existing or future climate change legislation). The review will also seek to revise and refresh suitable stretching ambitions in line with new evidence and national targets. 3.8.3 Council progress against their commitments set out in the New Nottingham Declaration (see 4.5). 3.8.4 The extent to which the MOU is successfully helping the UK to meet its national climate change target obligations (tonnes of GHG saved on own estate, and with influence - see data section in section 6). 3.8.5 The extent to which councils are playing an active role in delivering climate change mitigation and related policies, such as the Green Deal. 4.1 The Secretary of State for Energy and Climate Change and senior political representative from the LG Group will meet annually in the spring of each year to review the MOU, the Annual Report and council action on climate change. 4.2 The LG Group Environment and Housing Programme Board will take responsibility for the MOU within the LG Group. The Devolved, Sub-National Reform and Local Carbon Accountability (DSRLCA) Project Board will take responsibility for the MOU within the DECC. Both boards will respectively review council and DECC action on climate change and agree a publicly available Annual Report. 4.3 The Secretary of State and a senior political representative from the LG Group will appoint appropriate Senior Civil Servants from DECC and senior responsible officer from the LG Group to work together to ensure that the milestones in Annex A are met. 4.4 The MOU establishes and support a Nottingham Declaration Board or other appropriate representative board, consisting of senior and political representatives from the LG Group, councils and invited partner and delivery organisation, which will collaboratively oversee the Nottingham Declaration Board's Action PLan and council-led agreements and targets. DECC will be represented on the group and other government departments can observe where appropriate and when invited. The Nottingham Declaration Board's Action Plan will cover the policy areas in the LG Group offer and any other relevant policies that arise during the course of the MOU. 4.5 The Nottingham Declaration Board will design a mechanism for councils to demonstrate their commitment to continued action on climate change, and will enable them to sign up to locally appropriate targets and goals. This will be in the form of a 'New Nottingham Declaration' (which should be in place by October 2011, as set out in Annex A). 4.6 An officer-leval delivery group consisting of DECC and LG Group officials will meet quarterly to review progress on the MOU, MOU Milestones and general council involvement in reducing carbon emissions. 5.1 The milestones set out in Annex A are for the first year of the MOU. These milestones are designed to establish the Nottingham Declaration Board, the New Nottingham Declaration Board's Action Plan, as well as the process and timescales for evaluating the success of the MOU through the development of the Annual Report. Annex A will be updated annually and will set out the strategic actions to be pursued over the subsequent 12 month period - these actions will be agreed as part of the Annual Report. 6.1.2 Local homes, businesses and transport within the council control and influence. 6.2 Data from these two sources will help to underpin the evaluation of the success of the MOU in 3.8.4. 6.3 DECC and LG Group will work together to make data that is already published by DECC and by local councils more visible, transparent and that the opportunities available from the publication of data are fully realised. 7.1 DECC will work together with the LG Group under this MOU to assist in the delivery of the LG Offer on Climate Change, Nottingham Declaration Board's Action Plan and to enable councils to reduce carbon emission at the local level. 7.2 DECC will work with the LG Group to ensure the experience of councils are reflected in the DECC's ongoing evaluation of policies, and that the Department's future policy positions take into account local ambition and delivery. 7.3 At the beginning of the policy formation process, DECC will consider any impacts of the policy on councils, any delivery role councils can take or contribute to, or where they can be active partners to achieving the objectives of the policy. 7.4 As policies are initiated or adapted, the role of councils and the impact of the policies on councils will be integral to DECC's approach. 7.5 DECC will facilitate meetings between the LG Group, other government departments, and local government, on energy and climate change issues as identified in the Nottingham Declaration Board's Action Plan. 7.6 Subject to legal and Ministerial advice, DECC will share with the LG Group information relevant to achieving the objectives set out in this MOU. Such information mau include publications, consultations and press materials which may be disclosed to the LG Group on a confidential basis ahead of their publication. 8.1 The LG Group will take a leadership role in encouraging all councils to demonstrate their ambition on climate change through the New Nottingham Declaration and other appropriate agreements or declarations. 8.2 The LG Group will encourage all councils to play their full and active part in reducing emission through the three areas of focus set out in 3.5, and will develop and implement plans for reaching out to those councils that do not take a full and active part in reducing emission through the three areas of focus set out in 3.5, and will develop and implement plans or reaching out to those councils that do not take a full and active part in reducing emissions. 8.3 The LG Group will actively seek their council council members' views on the MOU, LG Offer on Climate Change, subsequent action plans and DECC policy. These views will form part of the Annual Report on the MOU. This does not exclude individual councils from expressing their views on DECC policy directly to DECC. 8.4 The LG Group will facilitate meetings between DECC, other government departments, local government on energy and climate change issues as identified in the Nottingham Declarations Board's Action plan. 8.5 Subject to legal and any internal advice provided to the LG Group, the LG Group will share with DECC information relevant to achieving the objectives set out in this MOU. Such information may include publications, consultations and press materials which may be disclosed to the DECC on a confidential basis ahead of their publication. 9.1 This Memorandum is a statement of intent, and should not be interpreted as a binding agreement. it does not creae legal obligations between the parties. The Department of Energy and Climate Change (DECC) was created in October 2008, to bring together: energy policy and climate change mitigation policy. At the same time, the UK needs to secure clean, safe, affordable energy to heat and power our homes and businesses. Creating a low carbon and resource efficient world means making structural changes to the way we work and live, including how we source, manage and use our energy. DECC exists to take the lead in tackling these challenges, and reflects the fact that climate change and energy policies are inextricably linked - two thirds of our emission come from the energy we use. Decisions in one field cannot be made without considering the impacts in the other. The Local Government Group is made up of six organisations that work together to support, promote and improve local government. The Climate Change and Sustainable Energy Act 2006, followed by the Climate Change Act 2008, are the two current pieces of legislation that Wealden must abide by. BLUEBIRD™ SMART SERVICE STATION - THE DEVONSHIRE PROJECT: Shown here is a concept Bluebird™ 7.68 - 15.36MW solar assisted service station containing 48-96 cartridges on a continuous charge cycle. Five of these stations (76.8MW) could recharge (refuel) up to 10 trucks or cars a minute. Next time you visit your Amoco, Chevron, BP Shell, Texaco or Supermarket fuel pump, count the number of cars leaving the station in a minute. You will find that an electric forecourt holds the potential to be quicker. During rush hour, 300 vehicles might be serviced in one hour. The truck shown here is 3.55 wide x 3.5 high x 7.7M long (8 x 11.5 x 25 feet). This station could accommodate trucks 4.46M (14.77 feet) high as shown, or with a raised roof, almost any truck currently on the market - though longer thinner trucks are more fuel efficient. BLUEBIRD™ UNIVERSAL ENERGY CARTRIDGE CONCEPT: These cartridge are designed so that they may hold many types of energy storage medium: lithium batteries and fuels cells being the most likely, though hybrid forms are also to be considered. The internal volume is approximately 0.290m2 or 16 cubic feet. The difficult part is getting the motor manufacturers to agree these basic dimensions. Failing which, to take the decision from them with directives. In our opinion a study is needed to define the capacity that will suit all of the car and truck makers. Cartridges could cost as little as $20,100 US dollars per unit (£15,000 GBP), hence the investment in terms of battery cartridges for five stations would in the region of $9.65 million dollars. The stations themselves could be built as pre-fabricated flat-packs for around $5 million dollars to which the land value and planning costs would need to be added. Ignoring the land variable for now, each SMART station would run @ $2,828,600 dollars or £2,186,286 pounds each. That is about the same price as some McDonalds franchises. FLAT PACKS - In this bungalow design for a two bed roomed eco home, a car port is part of the roof where the pitch is angled to the sun and the area is sufficient to power the home and provide energy to charge a small electric car. If grouped into a village of 50 - 100 units, the surplus electricity from one unit may be shared with other units to create a 'smart' energy self-sufficient society of the future. At 17.77 x 8.62 metres (48' x 28' feet) this concept world cost about $93.000 dollars (£70,000 pounds). The car shown here is a very small (low) city car about the same length as a Smart car, hence the garage area appears rather large. These units could be mass produced to lower the price even more. If only there was identified land on which to place them, any council could begin to build a sustainable society based on clean renewable energy. One of our advocates would be prepared to waive his fees, if the local authority concerned would be prepared to waive theirs on an outline application for 50 units - on land that would be identified by the advocate, with the appropriate notice served on the (farmer) landowner. How about it fellers? FORMAT AGREEMENT - Without the infrastructure for transport built into the equation for Smart town and cities, the zero carbon society is likely to take a lot longer to achieve. Transports infrastructure is therefore the starting point in the fight against climate change. The starting point for a viable infrastructure is a Universal Energy Cartridge something along the lines of the draft design in these diagrams. Getting vehicles makes to agree a suitable format is probably one of the biggest hurdles to overcome and is likely to require national and international agreements and the passing of laws in the signatory states.